I would love to get this exercise wheel.. where do I get such a thing? The only way at the moment is the wheel must be built. I posted a 7 part video series on how to build it in the category "Tips and Tricks" on this forum. I have built a couple of these for local residents that have pet skunks that were able to pick up the wheel. At this time i do not know how this could be shipped. If you could have someone build it for you the construction details and the hard to fine parts are listed in the description in part 1. If you need information or help while building this just let me know. I will glad to help. 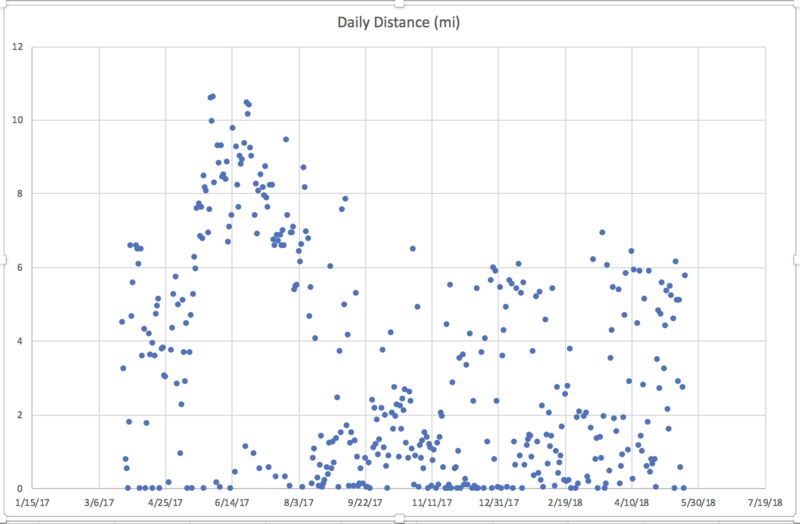 Here is Lulu's average daily running distance in miles per day, per month on her exercise wheel which is easier to see then the previous text file. It is amazing and she going strong even while i am writing this! This is what she ran and walked since she got in the wheel one year ago unti this year now!